I stepped onto the porch Saturday morning and saw what appeared to be a leaf laying there. I realized it wasn't a leaf at all, but a moth. I ever so gently lifted it and placed it on these hens and chickens so that we wouldn't step on it as we went up and down the steps. This little "life lesson" taught me that things aren't always what they seem. What at first seemed to be a brown leaf, turned into something much more beautiful. Of course, this could go both ways, right? We should also be on guard for those who really aren't who they say they are! Watch out for false prophets. but inwardly they are ferocious wolves. Good Morning, A lovely moth to illustrate the verse. I do see the owl! May the Lord bless your Monday. What a great "life lesson", Debbie! Thank you so much for sharing both the picture and the life lesson. And...yes...I do see the owl! 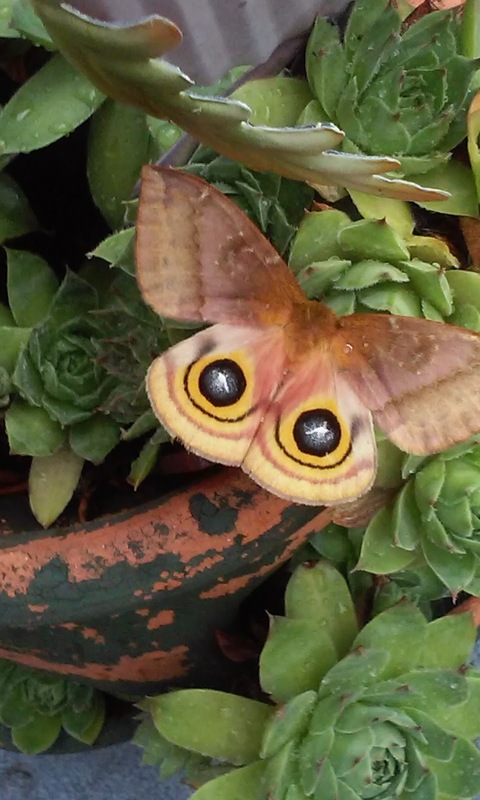 I still have to wonder why God would have designed the moth's wings to resemble an owl. Maybe for protection? If something saw it from above, it would think it was something else because of the eyes?!? I just know it was beautiful! We're seeing some of those ferocious wolves these days. But look at the beauty all around us, including a brown leaf turned into a lovely moth! God reminds us constantly to trust in Him. I'm trying!! Oh, yes we are....as the leaders of our country, even, Ms. Terri. Very scary....but GOD is still in control and He knew what was going to happen long before we could have ever even imagined it. We just need to pray, pray, pray! Thank you for ALWAYS being such an ENCOURAGE-ment to me!!! You're a very special Lady! I immediately saw owl eyes!! How pretty! Good lesson, too. I love your new header for your blog. Thanks so much for stopping by. I ALWAYS enjoy comments....and encouragement! HOPE you've had a great Monday! I love the moth. I have never seen one but have seen one in a book. Good scriptures to go with the picture. I don't think I've ever seen one quite like that one, either! It really was beautiful! Thanks for taking the time to comment, Ms. Karen. Oh, Ms. Mary....if only I would be attentive to everything He tries to show me....sigh.